Morayshire is in the North East of Scotland bordered by Nairnshire, Banffshire and Inverness-shire. Horse riding in Morayshire is plentiful with many riding schools and equestrian centres catering for the novice or experienced rider. Being in the Highlands region of Scotland brings with it wild, untamed scenery, rugged coastlines, character villages and a wealth of historic sites. Perfect for the adventurous trail rider or those of us who love trekking. Morayshire is also the land of whisky and the Glen Moray Distillery is a warm, friendly and informal working distillery in Elgin. Again perfect, for the horse rider that likes a little bit of warmth on the trail. Morayshire is situated deep in the Highlands of Scotland. It is just a short drive from Inverness and is the scene of many Highland battles between the clans. In fact Cawdor castle and the story of the legendary Macbeth is very close to this area. The Vikings originally landed in the Morayshire area, mixed with the Highland Scots and have since become part of the many clans that make up the Highlanders. 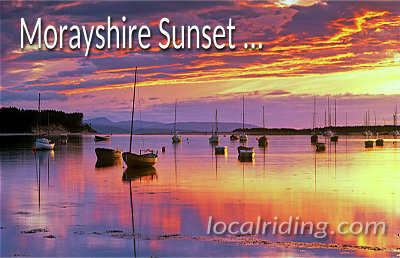 Morayshire is the perfect riding holiday retreat in the Scottish highlands. Moray in Scotland is home to the only Malt Whisky Trail in the World, Seven Distilleries and the Speyside Cooperage are all within easy reach by car. The Malt Whisky Trail can be started in Forres as Forres is home to two of the Distilleries, the Benromach distillery and the Dallas Dhu which are both open to visitors. If you are visiting Morayshire it’s always good to take a few sweaters with you. Morayshire air can be quite brisk, even in summer. However it is also less polluted and you really do get a good breath of fresh air. Morayshire is a good place for bird watching and you may even see the rare osprey, as this is one of the few places it can be found in Scotland. You will also see dolphins and of course the spectacular Northern lights. For the keen Historian or lover of Scottish history there is Cawdor Castle which is now over 600 years old. There is also Brodie Castle, which is set in its own magnificent grounds and is simply overflowing with historical facts. And don’t forget to check out the historic village of Auldearn. Scottish Culture is well served by the Nairn Highland Games, which take place on the third Saturday in August and the Forres Highland Games, which take place in the first Saturday in July. Angling on the River Spey which offers some of the best salmon fishing in Scotland, The River Nairn a salmon and sea trout river and the River Findhorn which is also well known for its salmon and trout fishing.